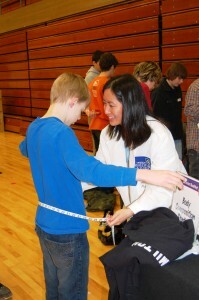 Thank you for your interest in volunteering with Let’s Get Healthy! We welcome all volunteers regardless of age or experience — just fill out this form to tell us a bit about yourself. For more information about Let’s Get Healthy!, check out our video, visit our website, or follow us on Facebook. You will receive an automated confirmation message once you successfully submit this form. If you have any questions, please contact Lisa Marriott (marriott@ohsu.edu). If you are not already in your desired career, how would you describe your career aspiration (select all that apply)? Are you affiliated with Oregon Health & Science University (as a formal employee, student, volunteer, etc.)? NOTE: This does not include volunteering with the Let's Get Healthy! program. How did you hear about "Let's Get Healthy!"? Do you speak any other languages? You may check multiple boxes. For future reference, please tell us which area(s) you would be interested in volunteering at a Let's Get Healthy! event. We will notify you by email about upcoming events in the areas you check. You may check multiple boxes. It depends, please notify me about all.